From luxury hotels to exotic destinations, teeing off on a golf holiday is a great way to indulge your passion and see the world. 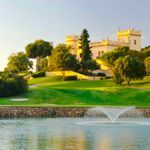 Exclusively for single golfers with a handicap, these trips with Solos Holidays range from long weekends in the UK to the Algarve, as well as winter sun. We organise a wide range of golfing holidays exclusively for single travellers of all ages in the UK and some of Europe’s most gorgeous resorts. 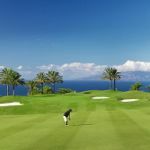 We have a wide range of one week golfing holidays in the Algarve, Mallorca, Lanzarote, Cyprus, Turkey and Corfu. Each venue has been selected both for the outstanding golf course and for the comfortable hotel and amenities off the course. There’s a prize-giving ceremony at the end of each week but it’s as much about relaxed and sociable fun in like-minded company as the competition! 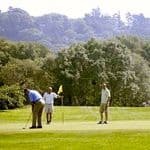 If time is short, our UK golf weekends are held in Norfolk and Shropshire with two 18-hole rounds of golf, a sociable atmosphere and luxury hotel accommodation with great facilities. It’s the perfect introduction to our golf holidays and you’re guaranteed to be in like-minded company. All our golf holidays are accompanied by one of our experienced Tour Leaders who will be there to welcome you, organise sociable competitions and be on hand throughout. Prices include use of a double or twin room for single occupancy as well as breakfast and dinner. Handicap certificates are required for most of our holidays. Please take care to check. Find out more about our singles golf holidays.